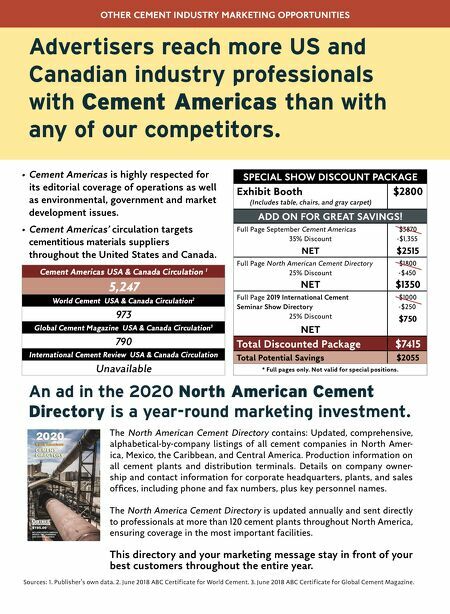 2020 North American CEMENT DIRECTORY INCLUDES NORTH AMERICA, MEXICO, THE CARIBBEAN, AND CENTRAL AMERICA $195.00 An ad in the 2020 North American Cement Directory is a year-round marketing investment. Advertisers reach more US and Canadian industry professionals with Cement Americas than with any of our competitors. The North American Cement Directory contains: Updated, comprehensive, alphabetical-by-company listings of all cement companies in North Amer- ica, Mexico, the Caribbean, and Central America. Production information on all cement plants and distribution terminals. Details on company owner- ship and contact information for corporate headquarters, plants, and sales offices, including phone and fax numbers, plus key personnel names. 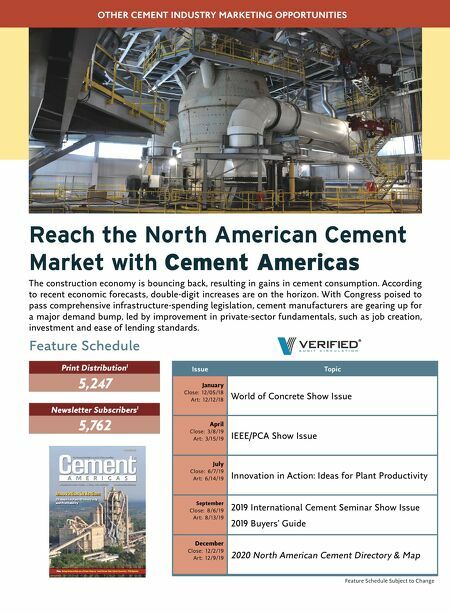 The North America Cement Directory is updated annually and sent directly to professionals at more than 120 cement plants throughout North America, ensuring coverage in the most important facilities. This directory and your marketing message stay in front of your best customers throughout the entire year. • Cement Americas is highly respected for its editorial coverage of operations as well as environmental, government and market development issues. • Cement Americas' circulation targets cementitious materials suppliers throughout the United States and Canada. Sources: 1. Publisher's own data. 2. June 2018 ABC Certificate for World Cement. 3. June 2018 ABC Certificate for Global Cement Magazine. Cement Americas USA & Canada Circulation 1 5,247 World Cement USA & Canada Circulation 2 973 Global Cement Magazine USA & Canada Circulation 3 790 International Cement Review USA & Canada Circulation Unavailable OTHER CEMENT INDUSTRY MARKETING OPPORTUNITIES SPECIAL SHOW DISCOUNT PACKAGE Exhibit Booth (Includes table, chairs, and gray carpet) $2800 ADD ON FOR GREAT SAVINGS! Full Page September Cement Americas 35% Discount NET $3870 -$1,355 $2515 Full Page North American Cement Directory 25% Discount NET $1800 -$450 $1350 Full Page 2019 International Cement Seminar Show Directory 25% Discount NET $1000 -$250 $750 Total Discounted Package $7415 Total Potential Savings $2055 * Full pages only. Not valid for special positions.